New reservations are easy to enter into Execu/Suite. There are several ways to get to the reservation screen. Do what is easiest for you and your practices. Each of the following methods will get you to the Reservation screen. If you look up availability before making a reservation, you can look at the Tape Chart (Rooms Availability) or Room Types. From there you can select a room or room type and make a reservation. See Availability. If your practice is to look up existing guest profiles before making reservations you can go to People/Profile, bring up the profile, and then click "Make HOTEL Reservation" from the link at the top left guest profile screen. This is less common but available if you wish to do it this way. If you have toolbar icons, you can click the "Make Reservation" or "Reservations" icon. If you navigate from a menu, go to Reservations Operations - Enter/ Change Reservation". This is the reservation screen. It is laid out in a logical way, allowing you to enter information easily as you speak to guests. We highly recommend that you use your Tab or Enter key to navigate through this screen rather than using your mouse. This way you will be sure not to skip any fields. Skipping a required field will prevent you from saving the reservation until the field is populated. The first section of the reservation screen is the stay information. "Group code: " should be blank unless this guest is part of a group. If the guest is part of a group, enter the group code or use the magnifying-glass look-up icon to look up the group. You also may press ? then Enter on your keyboard. This is quicker than using your mouse to click the icon. The group must already be set up; you cannot set up the group here. "Arrival date: " should be entered DDMMYY such as 051415. You may click the calendar if you prefer to select the date from a calendar. 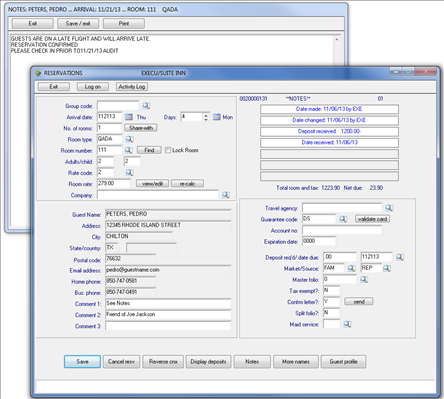 If a group code was entered for this group, the earliest group arrival date will automatically display. You may leave it or change it if this guest is not arriving with the group. The day of the week will display after you have entered the date. "Days:" will be the number of nights. You also may enter the departure date MMDDYY. You also may enter click the calendar to select the departure date. If this guest is part of a group, make sure to enter the correct number of nights for this guest. The day of the week will display after you have entered the date. "No. of rooms:" should be 1. When you have completed this reservation you will have the option to "make another reservation" like this, should you need to do so for additional rooms for this guest. It is cleaner this way. Note: When there is a share-with reservation for this room, the subsequent reservations will default to 0 for "No. of rooms". Do not change it. "Room type:" may be skipped if you prefer to reserve a specific room rather than reserve a room type. The room type will be filled in automatically if you assign a room number. If you wish skip the room number field you need to enter a room type. Each reservation must have a room type or room number. To look up a room type you can click the magnifying-glass icon or type ? then Enter on your keyboard. "Room number:" may be skipped if you do not need to assign a specific room number to this reservation. You may go back into the reservation at a later time to assign the room prior to check-in if you wish. Note: If this reservation is part of a group and you wish to do a one-button group check-in, each reservation for the group MUST have a room number assignment. Each reservation must have a room type or a room number. Using the "Find" button will allow the system to find a room (next available). This is handy to save time. You can click "Lock Room" if you do not want this guest moved to a different room. "Lock Room" will have to be unchecked in order to move the guest. NOTE: If this room was set up as a connecting room, a prompt will ask if you wish to reserve the connection room also. Make sure to answer this prompt accurately; if the connecting room is selected, the two rooms become a single entity and both are relieved from inventory. You will not be able to un-reserve the second room but would have to cancel the entire reservation and start over. "Adults/child:" includes two fields, one for the number of adults and one for the number of children. Depending on your rate structure, the number of adults may affect the room rate. Children are considered "free" in the software and do not affect the rate. We do not define "children". The number placed in the "adults" field determines the rate, regardless of age. 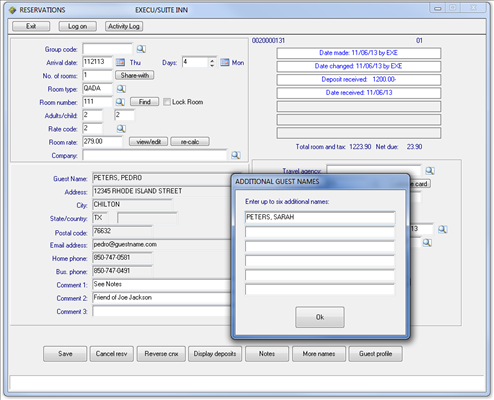 The "additional person" rate is assigned in Rooms or Room Types setup. "Rate code:" should be 1-6, W, M, or P. The default rate code is assigned in the Parameter Record . Rate codes are set up in Rooms or Room Types. Default titles are High (code 1), Rack (code 2), Discount 1 (code 3), Discount 2 (code 4), and Discount 3 (code 5). These titles may be changed by editing MENUINI.FIL. Rate code 6 is for Comp and calculates into your statistics differently than a rate code 1-5 with a zero rate. Rate code 7 is for owner comp for condominium properties. W is weekly and will post at night audit "post room and tax" on the day of the week designated at check-in. M is monthly and will post on the day of the month designated at check-in. You will use P for a package. A popup will prompt for package code for this guest. To look up rate code title you can click the magnifying-glass icon. If you enter a different rate code than the default, a popup will ask if you wish to re-calculate the rate. "Room rate:" typically will default to the rate assigned to this room or room type for this date or date range. A grid will display rates for the dates of the guest stay. You should change rates in this grid, not on the main reservation page. To view or change rates, click the "view/edit" button. If you have made changes (such as number of adults) you can click the "re-calc" button. "Company:" will display the group name if there is a group code in this reservation. Otherwise you may skip this field. If you wish to use this field for rate calculation (such as AAA, AARP, 12% Discount, Military, ABC Company, etc.) or to track stays by company, you may enter the code here. We highly recommend looking up the company by using the magnifying glass icon rather than simply entering the company name. If you do it this way you will make sure you select the correct company and that you don't end up with multiple instances of the same company such as "AAA", "A.A.A." A A A " and so on. Company rates and rules are set up in the Corporate File. 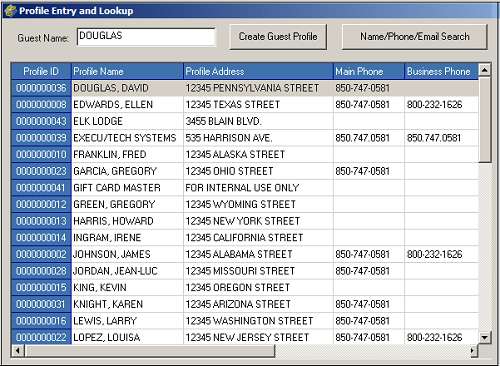 When you press Enter or Tab from the Company, the Guest Profile window will open. That is discussed next. The Guest Profile window will open when you get to the Guest Name field. For most properties the Profile Entry and Lookup window will open, allowing you to search the database for existing guest profiles. Moving from field to field, it is quicker to press Enter than to use your mouse. After you complete and save the profile, the Guest Profile window closes and you return to the Reservation screen. This is where you will enter the remaining information for this reservation. "Comment 1: " This is where your cursor will be when you return to this screen. The field will be populated with the Guest Profile comment. If you wish to enter separate information here you may do so. Otherwise Enter through the field. "Comment 2: " The field will be populated with the Guest Profile comment. If you wish to enter separate information here you may do so. Otherwise Enter through the field. "Comment 3: " The field will be populated with the Guest Profile comment. If you wish to enter separate information here you may do so. Otherwise Enter through the field. "Travel agency:" If there is a travel agent for this guest, enter the travel agency code or click the look-up box to look the agency up by name. After you select the agency, a popup will ask for the agent within the agency. This is an optional field. 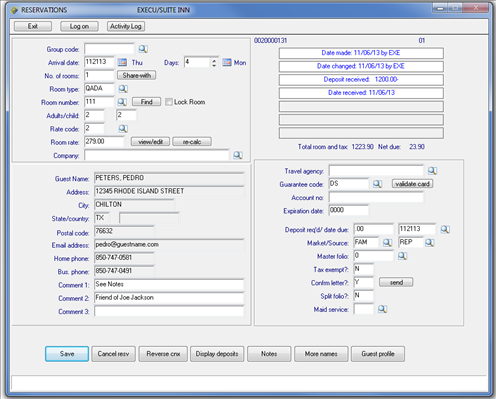 Some hotels use travel agency for employee commission tracking. "Guarantee code:" If you wish to enter credit card information for the guest, click Validate Card. At the prompts enter the cardholder information requested. Execu/Suite automatically will populate the guarantee code field with the correct payment code. NOTE: Validating a credit card does NOT post a payment or deposit; it simply creates a token for "card on file" which can be used for the deposit after the reservation is completed. If the guest is guaranteeing the reservation with a payment type other than credit card, enter a valid payment type such as CK or DB. The system considers a reservation non-guaranteed ONLY if this field is blank. To make a WAIT LIST reservation, type WAIT in the Guarantee code field. You might have to overbook the room in order to put it on the wait list. However, the room will not actually be overbooked by doing this. Then, when you receive a cancellation, you can print the WAIT LIST under Print Reservation Status Reports. Once the guest comes off the wait list, change the WAIT guarantee code to the actual guarantee code. "Validate card" Select this if you wish to create a "card on file" token for the guest. You will be able to use this card on file to post the advance deposit after you complete the reservation. This does not post a transaction nor guarantee the card for available funds. "Account no. 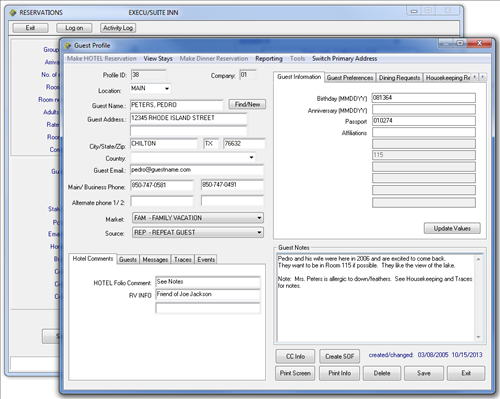 :" You only need to use this field for DB (Direct Bill) guarantee codes. Enter the Direct Bill (City Ledger) customer account code. "Expiration date:" This field will be grayed out and non-editable. "Deposit req'd / due date:" You system may be configured to display the amount of deposit required and the date the deposit is due s o that you can tell the guest. This is set up in MENUINI.FIL . "Market/Source:" These fields will be populated if you entered this information in the Guest Profile screen. The market segment is the type of guest (corporate, vacation, military, etc.). The source of business is how the guest heard about your hotel, or the referring agency. "Master folio:" You only need to enter a folio number if the guest's room and tax charges are to post to a different folio, such as with a group when the group master fill pay the hotel for guests' room and tax charges. "Tax exempt? :" Answer Y if this is a tax-exempt guest. A new little window will open allowing you to select the taxes for exemption. The default is N but if most of your guests are tax-exempt, the default can be changed to Y. "Confirm letter? :" Answer Y to include this guest in batch printing of confirmation letters. To print only this guest's letter, click the "Print Letter" button that will appear after you save the reservation. To email the confirmation letter, click "send" or type E in this field. If you have more than one email confirmation letter a menu will display, allowing you to select the letter to email. The default can be set to E for this field if you wish to send email confirmation letters automatically. "Split folio? :" Answer Y if you wish both a primary and secondary folio for this guest at check-in. Room and tax charges will post to the primary folio and incidental charges will post to the secondary folio. Separate credit cards may be preauthorized at check-in. Split folios are common for wholesaler (Expedia, etc.) guests or corporate guests needing separate folios. "Maid service? :" This field will be required only if "Enhanced housekeeping" is set to Y in the Parameter Record. If required, you will enter a one-character code or look up the codes by clicking the look-up icon. When the Save button highlights press Enter to save the reservation, or click the Save button or press Alt+A on your keyboard to save the reservation. Before saving the reservation you can select another option. "Notes" will allow you to add notes for this stay. These are different than the profile notes which remain in the profile. The reservation notes remain with this stay, from reservation to in-house folio to guest history but will not be saved into the guest profile. "More names" allows you to add additional guest names for this stay. They do not remain in the profile, as does "guests" entered into the profile. When the reservation is saved the screen will look the same but now the confirmation number will display both at the top and the bottom of the screen. A new set of buttons will display at the bottom. These are discussed below. After you save the reservation "Make another reservation like this?" will display and new buttons will appear. "Make another reservation like this?" allows you to duplicate this reservation. This is handy if you need to reserve multiple rooms, if the guest wants to make reservations for more than one stay, or if you have a group rooming list. Answer Yes if you want to make another reservation like this; answer No if you do not; or select one of the other options such as "Deposit". If you answer Yes to "Make another reservation like this?" a popup will ask, "Is This Reservation For The Same Guest Name?" It is important that you answer this correctly. If you answer Yes, then the same profile will be used for the new reservation. DO NOT change it unless you want to change the profile itself. Changing the profile will change the other reservation. See "Guest Name Changes-Profile ". If you are entering a rooming list, for example, answer No so that you can create profiles for each guest. Do not answer Yes if you are entering Share-with reservations. Click the "Share with" button. "Print screen" will capture the reservation screen and send it to the printer. "Reg card" will print the registration form for this guest. "Deposit" will take you to the Enter Advance Deposit screen. See "Advance Deposits". "Share with" will open a new reservation for another guest sharing the room with this guest. See "Share-withs ". "Print Letter" will send the confirmation letter to the printer. If you have more than one confirmation letter a menu will display, allowing you to select the confirmation letter to print. It is a good idea to print a Reservation Status Report for Reservations Entered by date (today) each day or at end of each shift so that you can verify that the information was printed correctly, a credit card was validated, a deposit was posted, etc. This is especially beneficial for new employees.